Mix and Chic: Guest post- Stylish, architectural bathroom design! Guest post- Stylish, architectural bathroom design! So you want your bathroom design to make a statement, to say that you are a person who enjoys and appreciates design, aesthetics and cotemporary style. Well, then here is my guide on how to create a bathroom that, while practical and efficient, will make a bold design statement that is certain to catch the eye. room each day, and so on. Fortunately, in the world of modern bathroom design, there is always a solution to be found. For example, freestanding, roll-top baths have long been the epitome of sophisticated, luxurious bathing, but compact, space-saving models are now widely available. Similarly, a walk-in wet room was once the sole territory of those with huge budgets and even bigger bathrooms, but a complete wet room installation can now be fitted into even the smallest of bathrooms. Every bathroom needs a focal feature, a strong design statement of intent, and a freestanding roll-top bath can be one of the most direct ways to achieve this. 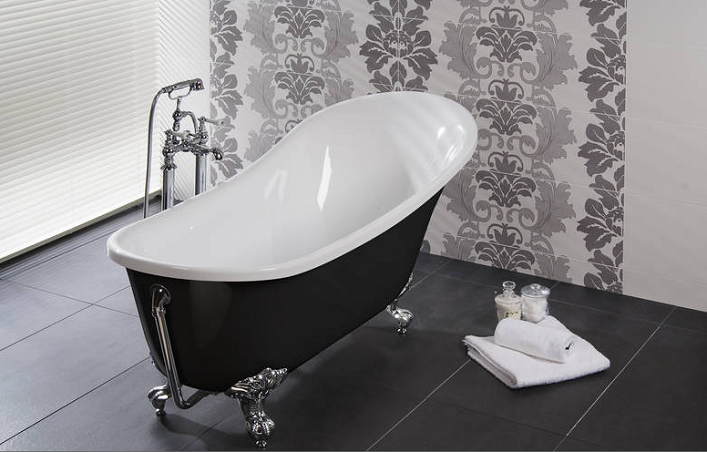 For a long, relaxing soak, a traditional freestanding bath, sitting on classic claw and ball feet and fed by freestanding taps is hard to beat as a way of indicating that you take bathroom comforts seriously! Alternatively, focusing on your basin area, the most frequently used section of every bathroom, is another great place from which to build your aesthetic. Three key features will define you basin area: Basin, taps and mirror. A basin with a larger capacity will always seem to be more user friendly, and in smaller bathrooms this can still be achieved with a bathroom which is wide and deep, rather than projecting out into the room. White ceramic or natural stone basins are the leaders in the field at the moment, and both are safe bets for performance and aesthetic impact. 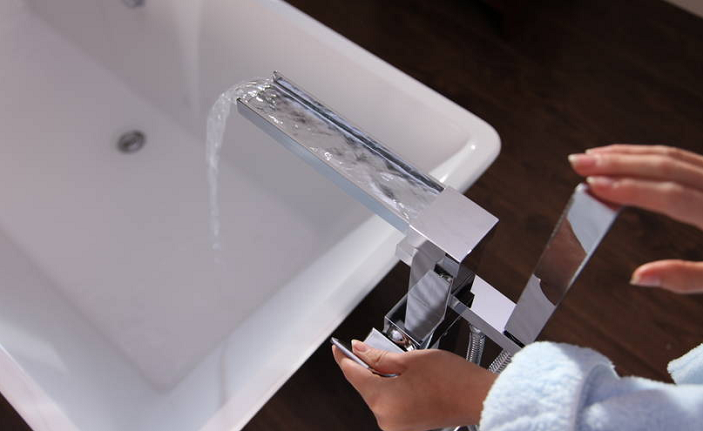 Waterfall taps are set to have a big year in 2013, the tap of choice for trend setters, combining cutting edge styling with graceful ease of use. Next, we come to the bathroom mirror: Mirrors are famously a short cut to enhancing the sensation of light and space in any room, and they form an integral part of any vanity area, so splash out and indulge yourself and invest in an illuminated bathroom mirror. Space-enhancing, glamorous and recalling all of those dressing room moments from classic films, but with a contemporary twist, illuminated mirrors are both a practical investment and a sure fire way to make sure that your bathroom stands out from the crowd. White walls were de rigeur during the minimalist heyday of the 90’s, but after you have selected your ideal suite and perfected you ideal basin area, you are going to want walls that enhance and increase the impact of your fixtures and fittings. Off-white or pastel walls will help to keep the room feeling bright and friendly, while providing rich and tactile warmth. A highly styled, architecturally influenced bathroom does not need to require months of planning or an extensive budget, just focus on getting the basics right and build from there. Good luck, and enjoy! Helen Davies is a senior content writer for Better Bathrooms, who sell good looking contemporary and traditional bathroom suites at realistic prices. Such good tips for updates to the bathroom!